I'm running low on blank passport pages which are sometimes needed for full page visas such as those issued by Armenia, India, and Vietnam. When I crossed the border into Turkey the other day I got my visa-on-arrival and stamp, but instead of putting it on a partly used page, which I have many, the guy at customs and immigration put them on a previously blank page. Now I have one fewer! What can I do to prevent or at least reduce the chances of this happening? It's worth remembering that there's likely to be a language barrier and it's always best to be ultra-nice to these border officials. Has anybody heard of any trick such as sticking bit of paper in your passport, either blank, or looking a bit like visas? I have noticed that nobody ever stamps a page that has a remnant of something once stapled in there in Japan. There is a kind of stub that had its major part torn off along a perforation. Might I be able to emulate this somehow or would that even be worse making the blank pages invalid for full page visas due to having holes from staples? I know some things can get very picky when it comes to customs and immigration. If you have a brand new passport, then keep all the pages together with an elastic band, and only release new pages when the old ones are full. This has kept things nice and orderly for me so far - the only place anyone took off the band was Taiwan where they at least stamped only the next page and not some random mid-passport place. 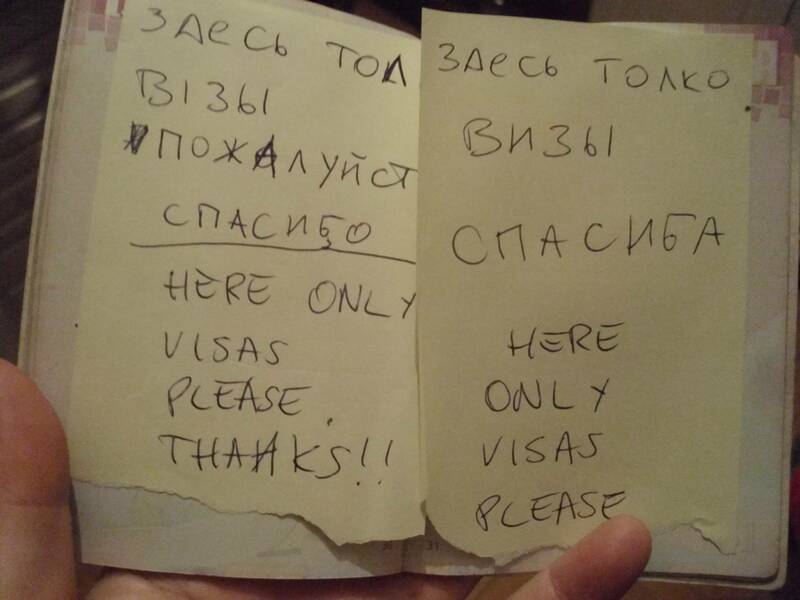 If your passport is already in use, then a full page post-it note works fine and leaves no residue - write on it "Reserved for Visa" if you think that will help. Make sure the sticky part of the post-it is towards the outside of the page so it's not so simple to just stamp underneath it. Hand signals. Turn to the page, point with your index finger, and indicate a stamping motion. They're passport officials, they'll recognise their most readily identified action ;) For extra certainly, point to a different page, and indicate with a shake of your head to NOT stamp - this will at least imply you're trying to convey something more than 'please stamp my passport'. Write a note in English (on a paper and put it in the passport) or ask in English. It is pretty rare to find an immigration officer who does not speak at least some English. Make sure you are really polite and friendly, some immigration officers are pretty quick to take offense and you don't want that. Make sure that the space you suggest is sufficient. Some countries have several stamps, so asking the immigration officer to stamp a page already full may be trouble. Renew your passport asap. The passport is one of the cheapest travel expenses, but a problem with your passport could ruin everything, so get a new one if you are likely to run out or come close to run out. Depending on your country of origin, you can get an "emergency passport" at the consulate. Those are delivered on short notice, so it can be a solution if you end up missing pages while in the course of your travels. I carry my International Certificate of Vaccination or Prophylaxis with my passport (as is its proper place), which also means I have a handy bright-yellow paper flag somewhere in the middle of my passport. Generally speaking, I've found that its a fairly effective means of keeping stamps on the half of my passport before the certificate, and no customs official has ever said a word about it. Go to a translation site such as Google Translate and print out a message in the language from the country you want to visit stating that you wish to have your passport stamped only next to existing stamps. Of course, you can't put something like "please do not stamp on any blank pages", as the words for 'stamp', 'blank', and 'page' are likely to get lost in translation. I would recommend printing out "Please place ink next to many ink". If they look at you like you're crazy, open the passport to the page you'd like them to stamp, and then hand it to them. Smile. Be relaxed. If you're still not getting the message across, pantomime a stamping action where you want them to stamp, and always smile. Wrap a piece of paper around the blank pages and write on it, "please do not put stamps on the blank pages as I am an overland traveller and need these pages for visas." All these suggestions are nice an all, but really - the answer to your question "What can I do to prevent passport stamps being put on blank pages?" is - Not a damn thing. Take the perspective of some border official that has to flip through a sea of stamps in your passport, flipping left and right to find out where the exit stamp, entry stamp, or visa stamp was found; just because you don't want to "waste" a page. Tampering with your passport, by attaching bits and bobs is frowned upon by most broder control/immigration officials. At one border check, I was asked to remove the rubber band before the officer would even look at the passport, so there went that trick out the window. The "please don't put stamps here" only half works. I have had limited success. The reason being at some border controls, the visa and the stamp have to go on the same page (you can't stamp the exit on top of the visa, it invalidates it). In the end, what I decided works all the time is to get a passport with extra pages. I am not sure if this is available from your country, but mine offers this. So I have no issues with stamps now. Except the other day when I went to get my Schengen - the new thick passport had trouble fitting in the MRD scanner. It is also worth mentioning that in some countries, an expired passport is not "cancelled" if it has a valid visa on it - you are issued a new passport, and the old one is stamped that it is not cancelled "due to bearing valid visa". You have to make sure you carry both with you though. So even if you run out of pages, you can always get a new passport issued and carry both of them with you. I managed to preserve two facing pages of my passport for about 6 months by stapling them together. Most immigration agents didn't even notice there was more than one page there, and thus utilised every last bit of remaining available space on the other pages. It was only when I went to Japan, with pretty much every other page jam-packed, that they applied sufficient attention to detail to find it, carefully remove the staple with a staple-remover, and stick their sticker and stamps all over it. "Dear handsome and Kind Sir, please could you stamp only on a page where there is already at least one stamp because I need to reserve the empty pages for full page visas which are required in some other nations which are utterly inferior to your own magnificent land." Of course I am just having fun with the text, but my serious answer is to just get a translation kindly asking them what you want and explaining why you want it. I always stick on one or two blank pages a small paper with the written mention " PLEASE DO NOT STAMP ON THIS PAGE !! " And it works fine, never had any trouble and have kept my passport valid till the end. Not the answer you're looking for? Browse other questions tagged visas customs-and-immigration passports tips-and-tricks passport-stamps or ask your own question.